Branded content. Online video. Mobile. Email. Social. To celebrate National Nurses' Week, we wanted to portray nurses in a way that contradicted the typical stereotypes. They do so much more than wipe brows and follow doctors' orders. Today's nurses are the critical link in the healthcare chain – working as primary care givers, researchers, innovators, executives, policymakers and thought leaders. It must have resonated as the campaign became the most successful National Nurses' Week effort Chamberlain ever ran. In fact, our #NurseStrong social executions received the highest engagement rates of any social campaign for the university to date. Display. Mobile. Online video. TV. Branded content. 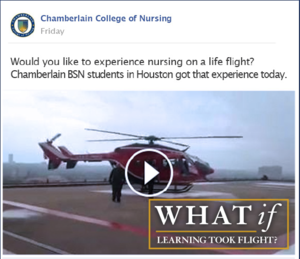 As the country's largest nursing college, Chamberlain is in a unique position to effect change in healthcare. In the What If? 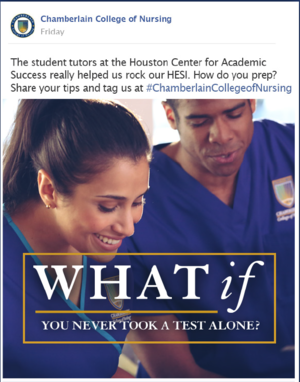 campaign, we sought to rethink and reimagine healthcare and nursing education. It sought to answer the big questions and open ourselves up to a world of possibilities.